As a transfer student, Cambry Bennett says she had a smooth transition to the University of Illinois Springfield thanks to the UIS Admissions Office. Now she’s helping prospective students learn about UIS as a Student Ambassador. As a Student Ambassador, Bennett gives campus tours to high school students and their parents who are interested in attending the University. She is also a part of UIS Preview Days where large groups of prospective students visit campus. Bennett, a liberal students major, says she enjoys meeting new students and learning about their educational goals. “I think it's very cool to see them when they do accept UIS and we see them on campus and they say 'hey you gave the tour'! I think that's really cool to be a part of because you're already part of their experience at UIS before they even start,” she said. As a commuter student, Bennett lives in her hometown of Pawnee, Illinois and drives 20 minutes to campus each day. “I'm able to still be involved in my community as well as share my community here at UIS,” she said. On campus, Bennett is a member of the Commuter Student Association and sings in the UIS Music Choir Ensemble. She’s also a member of International Student Fellowship, a group which aims to help international students feel welcome in Springfield. This past summer, Bennett traveled to seven foreign countries with the group Youth With A Mission as part of an educational Christian mission trip. “It allowed me to teach music as well as teach English through the music abilities and to also learn different cultures, different languages and things like that,” she said. Following graduation from UIS, Bennett would like to continue to travel world-wide and teach English through mission work. “I believe UIS has been a key point to what I want to do in the future and I believe that it has helped me to be able to grow in my experiences of not only learning to be a leader, but also to be able to work with people. I'm so glad I made the decision to come to UIS,” she said. 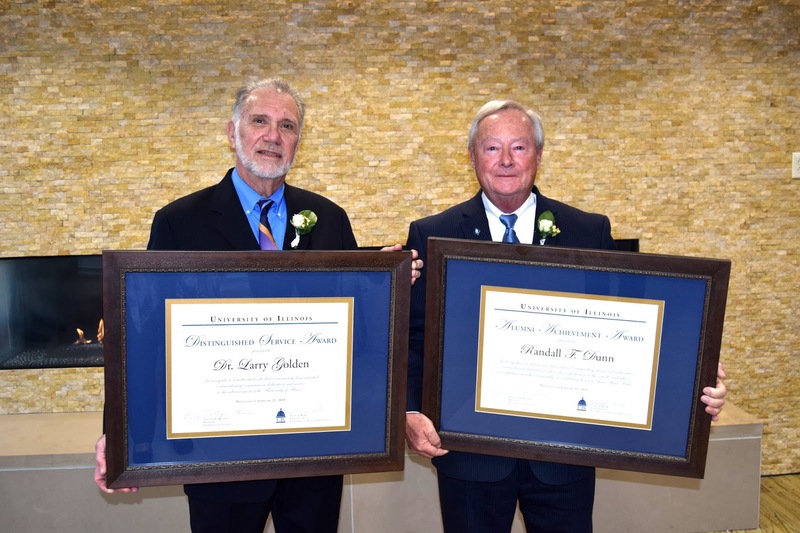 The University of Illinois Springfield honored the significant achievements and contributions of Randall F. Dunn and Larry Golden during the annual Alumni Gala on Friday, February 22, 2019, at the UIS Student Union. The 2019 Alumni Achievement Award for outstanding success and national or international distinction in one’s business, profession or life’s work was presented to Randall F. Dunn, a southwest Florida entrepreneur and community leader. The award is the highest honor bestowed upon alumni of the University. Dunn earned both his bachelor’s and master’s degrees from UIS, then Sangamon State University, in the 1970s. Upon completion of his graduate degree, Dunn relocated to southwest Florida and within 18 months, partnered with a radiologist to establish the Oncology Center, a radiation therapy and medical oncology cancer treatment center. Dunn also administered Radiology Associates, a hospital-based radiology practice. Dunn and his partner sold their holdings to Navix Diagnostix (Navix Imaging), a merger which saw Dunn become senior vice president of Navix Imaging, Inc., overseeing regional growth and expansion. Fueled by a passion for entrepreneurship and leadership, Dunn went on to found multiple organizations devoted to medical practice management; home, condominium, medical facility and hotel/motel development; and personal and business finance. Dunn’s passion for leadership has made a significant impact on his local community in southwest Florida. Dunn is credited with leading the Punta Gorda Revitalization Committee; YMCA; American Cancer Society of Florida; United Way; and has helped found, or served as a member of, other non-profit, community focused organizations including his local Chamber of Commerce, where Dunn was awarded Pacesetter of the Year. Dunn is a past recipient of the UI Loyalty Award for Exceptional Alumni Service; served on the Development Advisory Board and the National Commission on the Future of UIS; initiated the Capital Steps Scholarship Fund drive, financing its first scholarship; and is a former member of the UI Alumni Association board of directors. His daughter, Rebecca (Dunn) Albertini, is also a UIS graduate, having earned both a business administration and MBA from the University. The 2019 Distinguished Service Award for extraordinary commitment, dedication and service to the advancement of the University of Illinois was awarded to Springfield resident Larry Golden, UIS emeritus professor of political science and legal studies and founding director of the Illinois Innocence Project. The award is presented to individuals or couples whose consistent, exceptional and meritorious service has made significant impact on the University’s overall welfare and advanced its mission. Golden is a founding faculty member of the University who earned his Ph.D. in political science from the University of Minnesota, who has dedicated his life and career to teaching and activism on the issues of civil rights and liberties, and of law, inequality and justice. When Golden first arrived to Springfield, he helped organize efforts to address school desegregation, and the form of local government and representation. Golden helped found The Springfield Project (TSP), which seeks to unite the city as a community by working to improve the quality of life for all throughout its neighborhoods. Founded upon principles of a similar organization based in Atlanta, Georgia, a service model was implemented to help improve Springfield in areas of most need. Golden helped found the Downstate Illinois Innocence Project, the forerunner to the Illinois Innocence Project (IIP). The IIP seeks to bring justice to the wrongfully convicted through advocacy, education and reform of the criminal justice system. UIS undergraduates work alongside law students from the state’s public law schools and attorneys to investigate and legally pursue claims of innocence. Golden has been instrumental in securing more than $3 million in grants for IIP in the past 8 years. Golden retired from full-time teaching and continues to volunteer with IIP. In addition, Golden contributes to a course on conviction of the innocent; and presents on the topic of wrongful conviction and the work occurring across the country to free the innocent. His distinguished service and leadership are recognized nationally. Golden is a former executive board member of the National Innocence Network, the organization linking more than 50 innocence projects around the country. Golden is also a past recipient of the Courageous Voices Award, presented by the Jewish Council on Urban Affairs. The award recognizes individuals who are at the forefront of pressing issues affecting the community. Geetu Sharma came to the United States to be part of the Graduate Public Service Internship Program at the University of Illinois Springfield. In October 2018, Sharma started interning in the Office of Health Promotion at the Illinois Department of Public Health (IDPH) where she works to prevent cases of youth suicide. Sharma, who is earning her master’s degree in public health at UIS, is also active on campus as the Graduate Student Senator on the Student Government Association and president of Asian Student Organization. She previously worked as an International Student Ambassador where she helped welcome new students and planned events. Sharma was working as a dentist in New Delhi, India when she found out about the Graduate Public Service Internship Program from two friends who attend UIS. She wanted to gain more professional experience in the United States. Following graduation from UIS, Sharma would like to work for the Centers for Disease Control and Prevention in the United States. Kia Jones has become an expert in reviewing resumes and cover letters. The University of Illinois Springfield junior communication major works at the Career Development Center where she helps any student who walks through the door make sure they’re ready to apply for a job. As a student worker at the Career Development Center, Jones also helps out with big events, such as the Career Connections Expo. In December 2018, Jones was honored with the Student Affairs Employee of the Month award for her above and beyond work helping other students. On campus, Jones is also a member of the Black Student Union, where she’s involved in Black History Month event planning, and a member of the Capital Scholars Honors Program. She says she’s learned many lessons about leadership through her involvement on campus. Following graduation from UIS, Jones would like to work in media production and possibly broadcasting. She feels she made the right decision attending UIS. “I'm a firm believer that things happen for a reason,” she said. “So I came here for a reason. I am close to being that person who I have always wanted to be. The growth that I've received from being at UIS, I don't think I would have been able to get anywhere else." The University of Illinois Springfield Research Board has honored three former graduate students, all Springfield residents, with awards for their master’s thesis projects for the 2017-2018 academic year. 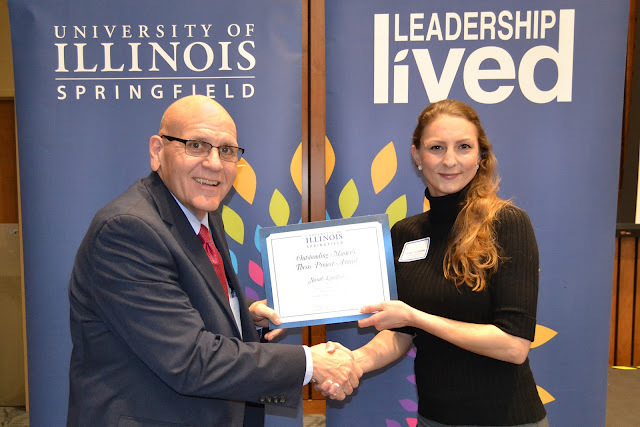 The awards were presented during a ceremony on February 7, 2019, at the UIS Student Union. Sarah Lindholm of Springfield was presented with the Outstanding Master’s Thesis Award. She graduated from UIS in July 2018 with a master’s degree in biology with a specialization in ecology and evolution. Her thesis study investigated long-term changes in the floristic quality of the reconstructed tallgrass prairie at the Emiquon Preserve, owned by The Nature Conservancy. Lindholm began attending UIS to pursue a bachelor’s in biology. She says the quality of education she received from her passionate professors inspired her to double major in environmental studies, and to eventually pursue a graduate degree. Throughout her academic career, she says, the mentorship, opportunities and hands-on experiences provided by UIS professors inspired her to challenge herself, find the fields of study she was passionate about and gain direct experience in them. While an undergraduate, she was able to volunteer in biology labs, intern at the Illinois State Museum and work for the Environmental Studies Department. During her graduate degree she worked as an aquatic biologist at the Illinois Environmental Protection Agency through the Graduate Public Service Internship Program (GPSI), and at the Illinois River Biological Station (part of the Illinois Natural History Survey). Her thesis was chaired by Amy McEuen and Hua Chen, both associate professors of biology, and Megan Styles, assistant professor of environmental studies. Lindholm now works as an environmental scientist and geographical information systems analyst at Northwater Consulting. She specializes in water resources, watershed planning, pollution reduction and habitat mitigation and restoration. Her future scholarly interests include publishing her thesis study and pursuing a Ph.D. in ecology. He earned his master’s degree in history from UIS in May 2018. His thesis was chaired by Holly Kent, associate professor of history. In July 2018, Blandford was appointed Illinois Governor’s Mansion Curator after having served as a Historic Site Superintendent for the Illinois Department of Natural Resources since 2004. Most recently he directed operations at six nationally significant state-owned historic sites: Lincoln’s Tomb, Veterans Memorials, Old State Capitol, Lincoln Law Office, Vachel Lindsay Home and Frank Lloyd Wright’s Dana House. As the curator of the Governor’s Mansion he is responsible for creating and implementing the mansion’s new strategic vision, which includes a greater focus on history, education, creative arts and the visitor experience. Blandford leads the development of events and marketing programs to attract visitors to the mansion, which is the third oldest Governor’s mansion in use today. McPherson graduated from UIS in May 2018 with a master’s degree in English. Her thesis chair was Stephanie Hedge, UIS assistant professor of English. Her research focused on teaching strategies foregrounding critical pedagogies, poetics, and embodiment in the classroom. She now proudly serves as an adjunct composition instructor at UIS. When she isn’t in the writing classroom, she is a registered nurse in the HSHS St. John’s Hospital Neonatal Intensive Care Unit. The Outstanding Master’s Thesis/Project Award is funded primarily through an endowment established by Nancy and Charles Chapin, along with gifts from other donors. In addition to providing funding for the Outstanding Master’s Thesis/Project Award, Charles and Nancy Chapin have provided support for Brookens Library, the Chancellor’s Fund for Excellence and scholarships. As a political science major, Ben Szalinski says he chose the University of Illinois Springfield because of its smaller class sizes and location in the state capital. He’s using that location to his advantage as president of the Student Advocacy Coalition. Szalinski, a Mundelein, Illinois native, is active in volunteer efforts as the treasurer of the Alternative Spring Break student organization. He traveled to Houston, Texas to clean up hurricane debris last year and plans to go to Puerto Rico this spring. He is also the community awareness chair for the Leadership for Life Service Organization. Off campus, Szalinski is completing an online internship with the U.S. Department of Veteran Affairs where he writes “Veteran of the Day” blog posts highlighting what veterans have done in their lives and activities they've done in the community. “After graduating from UIS, I want to go into a journalism field - work for a major media outlet reporting on different news stories or work as a public relations person,” said Szalinski. 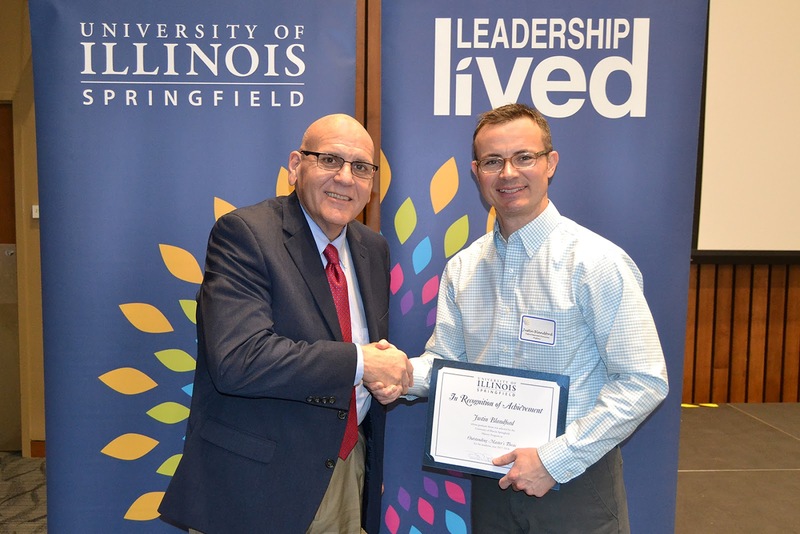 Szalinski also work on campus as an intramural sports supervisor for UIS Campus Recreation and previously was part of Model Illinois Government, a group which holds a state government simulation at the Illinois State Capitol each year.